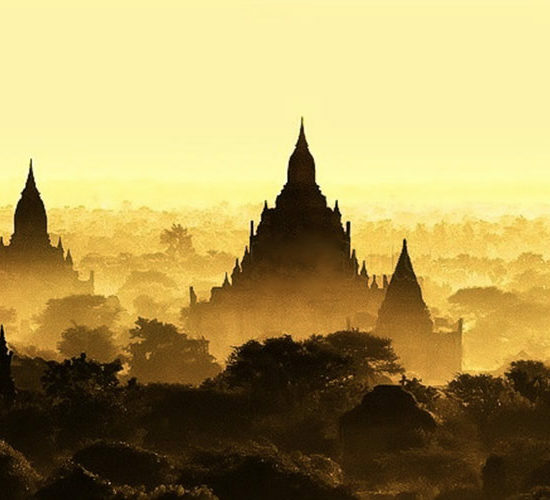 Land of pagodas and gold roofs, Burma has not ceased to amaze us. 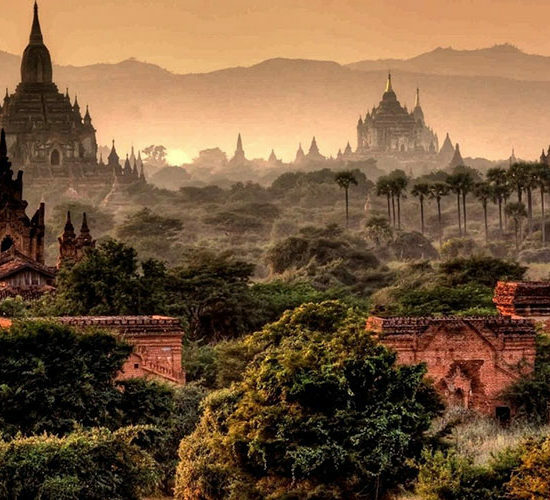 From the wonderful archaeological site of Bagan and its 2000 temples as far as your eyes can see, to the mysterious Inle lake, through Mandalay and its numerous monasteries and pagodas, Rangoon (Yangon) the capital with colonial charm and the splendid beaches in Ngapali in the south, the jungle to the east, the snowcapped mountains in the north flanking the Himalayas, Burma concentrates the splendors of all Asia. 15:00 Visit of the reclining Buddha Chaukhtatgyi Buddha Temple and its monastic complex. The Buddha is 70 meters in length. Situated on Singuttara Hill, to the west of Kandawgyi Lake, and dominating the Yangon skyline, it is actually an immense stupa 107m high, covered in gold plates, believed to contain relics of the four previous Buddhas of the present kalpa. These relics include eight strands of hair from the head of Gautama. This stupa is only but the heart of a giant complex of temples of diverse architectures, aglow with gold, dedicated to all the divinities and genies revered throughout the country. N.B: The guide is not private, but he is French speaking. Flight from Yangon at 06:30, arrival in Mandalay at 07:55. In Mandalay, transfer onboard the “Road to Mandalay” docked on the mighty Irrawaddy (Ayeyarwady) river in Shwe-Kyet-Yet. After lunch, a guided tour of Mandalay. Built in 1857 on orders from King Mindon to replace the old capital Amarapura, Mandalay lost its status since 1885 when it was overrun by British troops. 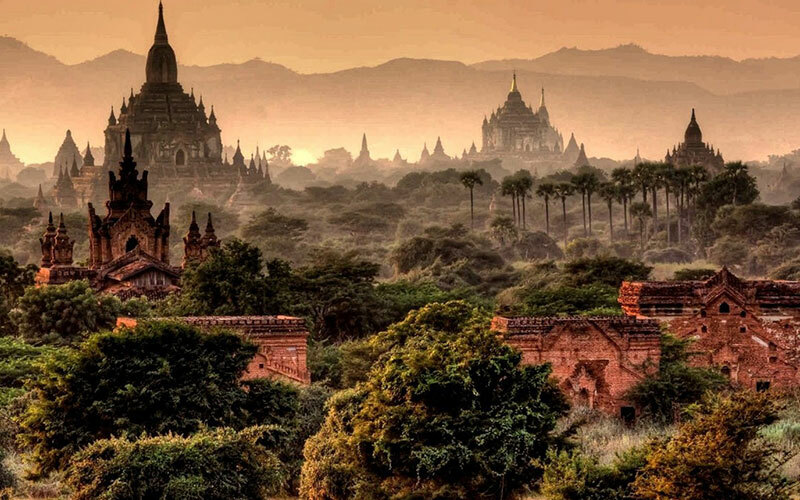 Second city in Burma, Mandalay is considered as the major center of Burmese Buddhism “the indestructible core of the Burmese soul” and flaunts over seven hundred pagodas! Tour the city of Mandalay: Visit of the Royal Palace and of the Schwenadaw monastery, only original structure of this architectural complex. Mandalay remains the artistic capital of Burma owing to its artist and craftspeople who were able to maintain their ancestral traditions. We will admire the manufacture of gold leaves intended for Buddha, witness to the unwavering religious fervor of the Burmese people. We will also visit the major pagodas on the foot of the hill, the Kyauktawgyi pagoda, and specially the Kuthodaw pagoda, where the Buddhist canons laws, recognized by the 5th Buddhist council organized by King Mindon, are engraved on 729 white marble tablets, often referred to as “The World’s Largest Book”. Return onboard the ship with a halt to admire the sunset on the river. After breakfast, visit of Sagaing Hills. The peaceful city of Sagaing with its five hundred stupas, its many monasteries perched on the hilltops near the banks of the Ayeyarwadi River, is the favorite capital of the Buddhists. At the end the morning, we sail toward the south. The rest of the day will be spent onboard the ship. The boat arrives to Bagan where more than 2000 temples and pagodas are spread out over an impressive plain. A guided tour will show you the most important temples. After lunch you will visit the interior of a few of the most significant pagodas. Optionally, you could rent a bicycle or a carriage to visit this fascinating site by yourself. By late afternoon, your guide will accompany you to see a breathtaking panorama of the plain. 10:15 Journey to Mount Popa, an extinct volcano 50km South-East of Bagan. Mount Popa is the magical mountain of Burma (Myanmar). It has been a pilgrimage site for at least 700 years. The 37 most venerated Gods of Burmese mythology (The Nats: venerated spirits who are given special powers) have been said to reside there. 15:00 After lunch, a short stroll in the sandalwood forest. 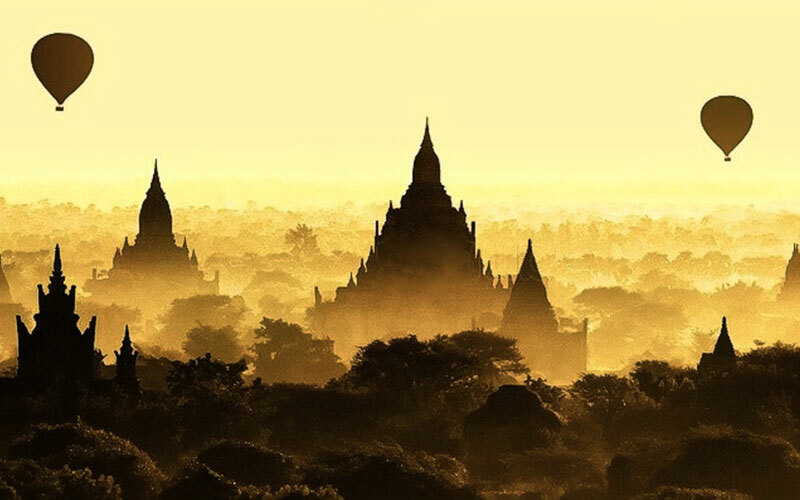 09:30 We head toward Bagan, one of the most beautiful capitals of Burma with its unforgettable sites and over 30 square miles of abandoned pagodas founded in the 9th century AD by the great King Mindon. This whole day will be dedicated to the discovery of the Bagan site. Shwezigon Paya: One of the most ancient stupas in the Bagan region, built by the two great kings Anawartha and Kyanzittha. This stupa that has the graceful shape of a bell, has become the model for practically all the stupas that were built later on in Burma (Myanmar). It is known as the place where the 37 pre-Buddhist Nats have been officially recognized. Temple Gubyaukgyi (Wetkyi-In): The Gubyaukgyi is a cave temple that shows perfect Indian architectural influence. The interior walls and ceilings are decorated with fragments of ancient mural paintings that depict scenes from the Jataka tales, the stories that tell about the previous lives of the Buddha. The Ananda temple: The temple layout is in a cruciform, which reminds us of Gothic architecture, with several terraces leading to a small pagoda at the top. The Buddhist temple houses four standing Buddhas, almost 9.5 meters high, each one facing the cardinal direction of East, North, West and South. Ananda Ok Kyaung: The brick sanctuary of Ananda is one of the rare surviving monastic constructions of the beginning of the Bagan The interior of the structure features some detailed murals bursting with bright red and green, showing details of everyday life from the Bagan period. Manuha Paya: This temple is built atop a giant image of Buddha. The name "Manuha" was given after the Mon king from Thaton who was held captive in Bagan by King Anawrahta. Inside three seated Buddhas face the front of the building, and in the back there's a huge reclining Parinibbana Buddha. All seem too large for their enclosures, and their cramped, uncomfortable positions are said to represent the stress and lack of comfort the 'captive king' had to endure. Nanpaya: This sanctuary was used as a prison in Manhua, although there are few supporting evidence to this legend. Lacquerware: Visit of a traditional workshop that produces unique lacquer objects. Transfer to Bagan airport for a 30 minutes flight to Heho. 07:50 Internal flight. Departure from Bagan. 08:30 This morning trek in the Mine Thauk Guided tour of the village populated by local tribes. 13:00 Lunch in a hidden Intha house: A private wonderful and traditional Intha house on the lake. This is a hidden village out of the beaten path. 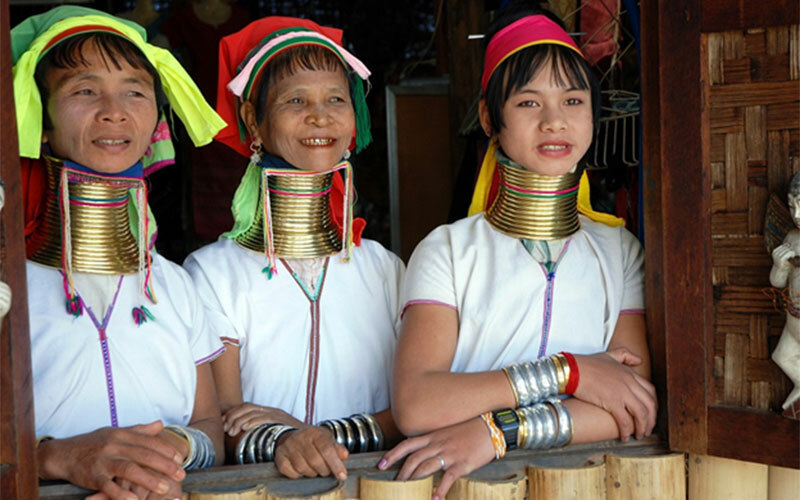 09:00 Trip to Lake Inle, land of the Intha people. The natives around the lake are known as fishermen and practice a distinctive rowing style which involves standing at the stern on one leg and wrapping the other leg around the oar. They are village and floating garden architects. 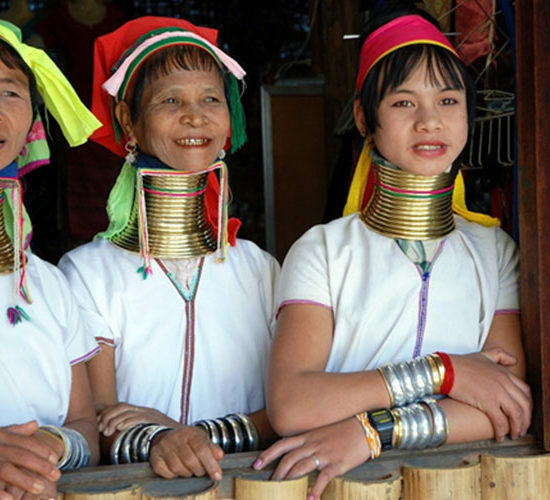 The lives of the Intha people revolve around the lake. Phaung Da woo Paya: Is the most sacred religious site with its five holy images of Buddha, floating villages and their gardens, the Nge Phe Chaung monastery, and silk and lotus fiber weaving workshops. You will then cross a stream to enjoy a boat ride to Inn Dein on the western shore of the lake. The boat will take you over a long canal where you will see the farmers growing their crops. This boat ride is the most picturesque on Lake Inle. After lunch, you can also cross a stream to enjoy a boat ride to Inn Dein on the western shore of the lake. The boat will take you through a long chain where you will see the farmers growing their crops. 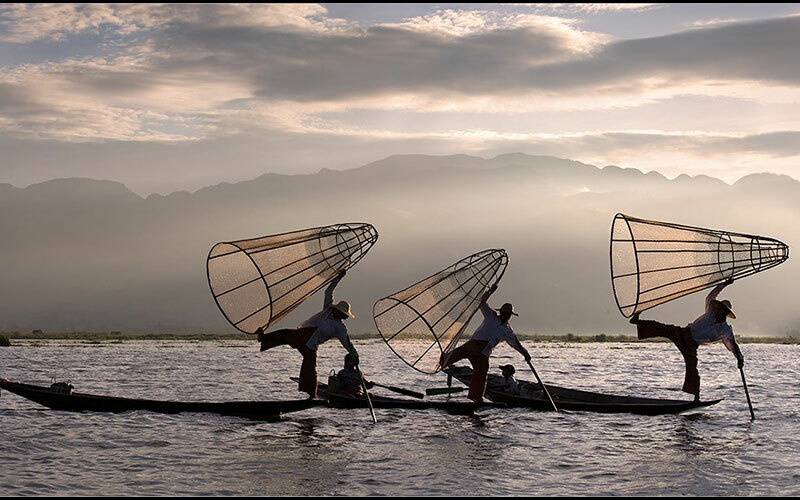 This boat ride is the most picturesque on Lake Inle. 19:30 Dinner and night at the Hotel. 07:00 Transfer to Heho airport for the flight to Yangon. Transfer to the airport for the return flight to Beirut via Doha.